In the far west of the state of Santa Catarina (FWSC) in southern Brazil, rice is produced from landraces grown in a dryland system, with production focused on household consumption. We characterized 60 local landraces of dryland rice and three improved cultivars from EMBRAPA—Arroz e Feijão for phenotypic diversity based on morphological characteristics. The landraces were collected in 27 rural communities of two municipalities in FWSC. Twenty-one morphological groups (MGs) were identified through the use of the Unweighted Pair Group Method with Arithmetic Mean clustering algorithm. Of these 21, 12 were represented by a single landrace. Grain morphology could be used both to distinguish among landraces and to identify different phenotypes within landraces. The geographical distribution of MGs seemed to be completely random. Of the 60 landraces, 35 presented a mixture of characteristics of the Indica and Japonica Groups; 24 presented only characteristics of the Group Indica; and four presented characteristics of Japonica. 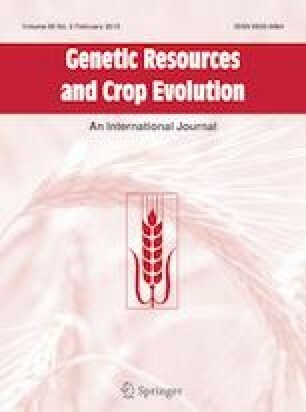 This finding is intriguing, since rice varieties adapted to dryland agriculture in Brazil generally have genic affinities to the Group Japonica. A clustering analysis based on both qualitative and quantitative characteristics identified four isolated populations and the formation of four groups (cophenetic correlation = 0.82). Some landraces from this study are being subjected to evaluation for their agronomic potential, to be followed by individual selection with progeny testing. This breeding approach is being proposed as a tool to support in situ/on farm conservation of rice landraces in FWSC. Tassiane Terezinha Pinto: Part of the doctoral thesis presented by the first author at the Federal University of Santa Catarina. This is a collaborative work involving family farmers in far western Santa Catarina with the support of students of the Federal University of Santa Catarina (UFSC) and partnership organizations (Secretary of Education and Secretary of Health of Anchieta and Guaraciaba, Parish of Santa Lucia of Anchieta, Small-Scale Farmers Movement/MPA, Union of Workers of Family Farming/SINTRAF of Anchieta, Association of Small Growers of Organic Maize Landrace and Derivatives/ASSO, Central Development Association of Microbasins of Guaraciaba, Integrated Company of Agricultural Development of Santa Catarina/CIDASC, and the Experimental Station of the Company of Agricultural Research and Rural Extension of Santa Catarina/EPAGRI from Itajaí/SC). Wander Luís Marques collaborated in the creation of the geographical location map of the FWSC. Coordination for the Improvement of Higher Education Personnel/Capes provided a scholarship to Tassiane Terezinha Pinto. No known or potential conflicts of interest exist for any author.